Bordering the shores of Long Island Sound in Westchester County, the Village of Larchmont in the town of Mamaroneck, NY, boasts the hometown comforts and charm you’d expect with a “village” designation, paired with the picturesque shore views and stately architecture characteristic of New England. Situated about 30 miles northeast of Manhattan (an easy 40-minute Metro North train commute to Grand Central), the per-capita income of Larchmont’s 6,000 residents makes it one of the wealthiest communities in the U.S. However, a seeming access to resources and tree-lined streets do not guarantee any community’s commitment to sustainability. 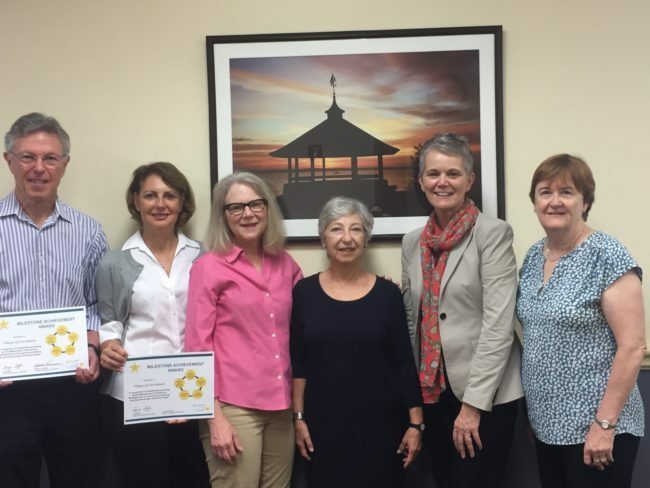 On the strength of their longstanding involvement, Larchmont has played a leadership role in the state and within the ICLEI USA network, by utilizing ICLEI’s Five Milestone Framework to achieve all milestones and exceed its initial greenhouse gas reduction goal ahead of schedule. In recognition of its efforts, the Village of Larchmont received the ICLEI Milestones Award for achieving all five milestones of emissions management on September 26, 2018, coinciding with Climate Week NYC. Larchmont has long been at the forefront of regional environmental efforts. The County took a pioneering step in 2006 by forming the Westchester County Task Force on Global Warming, comprising a diverse group of stakeholders; Larchmont Trustee Marlene Kolbert served on the Climate Protection Subcommittee. The 2008 Westchester Action Plan for Climate Change & Sustainable Development set a goal of reducing emissions countywide to 20% below 2005 levels by 2015—and an 80% reduction by 2050. Kolbert was also appointed Trustee-liaison of the Larchmont Environmental Committee in 2007. The Village of Larchmont joined ICLEI in 2008. And the Village took the NYS Department of Environmental Conservation Climate Smart Communities Pledge, which is similar to the ICLEI program, in 2009. Larchmont began implementing ICLEI’s Five Milestones of Emissions Management framework and in 2009, achieved the first two milestones by developing an inventory for the baseline year 2005, and by setting the goal to reduce emissions to 20% below 2005 levels by 2015. Stalwart committee members entered the data from numerous utility and fuel bills for 2005 into the precursor to ICLEI’s ClearPath tool, called the Clean Air and Climate Protection (CACP) system. The energy data, converted to a carbon-dioxide equivalent total, was included in the Climate Action Plan to serve as a baseline for measuring greenhouse gas reduction if all actions were undertaken. Shown receiving the award on behalf of Mayor Lorraine Walsh and the Larchmont Board of Trustees (left to right): Trustee Malcolm Frouman; Trustee Carol Casazza Herman; LEC chairperson Kristin Andersen; LEC committee member Caroline Birenbaum; Executive Director ICLEI-USA Angie Fyfe; and Former Larchmont Mayor Anne McAndrews. Then, Larchmont staff and volunteers got to work. The Village spent eight years implementing projects outlined in the plan. The process met a number of successes, such as: obtaining grants from the New York Power Authority to install solar panels on the roof of the Department of Public Works Village Yard building and to acquire two Global Electric Motor vehicles powered by those panels, increasing solar capacity for residents and businesses, increasing the use of LED lights by the municipality, and completing an ambitious library renovation, along with a number of other less-directly measurable actions, such as passing laws to ban plastic checkout bags from retail establishments, to prohibit idling by parked vehicles, and to reduce/eliminate hazardous pesticides used on Village properties. At the same time, members of the Environmental Committee organized several large, influential forums inviting elected officials, municipal staff, community leaders and citizen volunteers to share information and plans; presented many substantive and engaging public programs to involve the local community in “green” practices—including expos, film festivals, and a very successful discount buying program for residential solar electricity; and collaborated with neighboring communities—learning from and serving as a model to others. Several Environmental Committee members continued compiling municipal utility and fuel data for alternate years through 2013, a laborious task that was finally completed in 2017. Then, with support from ICLEI, the new ClearPath tool revealed that Larchmont’s goal had been surpassed in only eight years: Village emissions in 2013 were already 25% lower than 2005 levels. The Environmental Committee has now recommended that an automated system be instituted for ongoing real-time monitoring of energy and emissions. A key project challenge was garnering sufficient interest from residents at the beginning of the climate planning process and encouraging elected officials to collaborate with a resident-led committee. “You need your elected officials to be open to working with citizen committees, and not keep volunteers at arm’s length,” explains Trustee Casazza Herman. “That [distance] is not the culture of Larchmont. We have a plastic bag law, a law banning use of gas-powered leaf blowers during the summer—all that would go almost nowhere without the leadership listening.” The Village leaders realize that collaboration and interest from all requires a lot of give and take, outreach, and a tremendous sense of pragmatism. A related challenge was enforcement. Without the ability to enforce sustainability directives, any local government initiative stalls. Former Board Trustee and current Environmental Committee member Marlene Kolbert advises others to work alongside local law enforcement: “We met with the Police Chief after Year 1 of the plastic bag ban project. The Police Department had some very constructive ideas for how to improve the project for the year ahead. For instance, instead of calling it a ‘ban’, we called it a ‘Reusable Bag Initiative’.” Significantly, in the last few years, the Police have formed an ongoing partnership with the Environmental Committee to enforce the summer ban on use of gas-powered leaf blowers in the Village. Larchmont and Mamaroneck share a joint sanitation commission for solid waste. In just the past year, a volunteer-led Zero Waste project has succeeded in introducing home collection of food scraps for composting. The volume of non-food trash collected has already noticeably diminished. Early adopters deposit their compostables in bins at the Village Recycling Center. The Village has begun outreach to local restaurants and businesses to expand participation. The next step is to add compost pickups to the regular sanitation collection schedule. After this occurs, individual participation in food scrap recycling is anticipated to greatly increase. Members of the Environmental Committee staff Zero Waste activities at local events. They are eager to pursue a community-wide “Healthy, Pesticide-Free Yards” project emphasizing use of native and adaptive/non-invasive plants. And they are in regular contact with Sustainability groups in neighboring communities and at the County level. Larchmont also plans to look at the energy efficiency of community buildings, improve green building codes, and begin more infrastructure changes, but is realistic about costs and the capacity to undertake so many simultaneous projects. Also on the horizon for the Environmental Committee is to discuss how to make the Village more resilient. The initial impetus for creating an Environmental Committee in the late 1990s and early 2000s involved watershed issues and storm water management. In light of changing weather patterns, these continue to be important considerations. Following Hurricane Sandy, which impacted much of Larchmont, some resilience efforts were implemented, including more residents installing electricity generators. But the Environmental Committee wants to go further, realizing that resilience calls for a larger conversation among the community. ICLEI USA and Larchmont plan to continue their work together in the coming years to determine a baseline level of vulnerability and map options to mitigate threats. Follow Village of Larchmont’s Environmental Committee on the Village website and on Facebook. Learn how ICLEI’s Five Milestones and ClearPath tool can help you track municipal and community-wide emissions, forecast emissions change, and run scenarios for a successful climate action plan.